The Aspen/Marshall loop is as popular and well known a hike as Mt. Lemmon has to offer. Put in a little more effort, take a longer walk and drink up even more of that Lemmon sweetness with this expanded Aspen/Marshall loop. We'll take the Marshall Gulch trail out to Marshall saddle, skirt peak 8631 on the Mint Springs trail, then catch an old service road off Carter Canyon road in Summerhaven up to Radio Ridge and come all the way back on the entirety of Aspen Trail #93. Whew! Whee! From the immensely popular Marshall Gulch trailhead start your hike. You have a choice, I recommend starting on the Marshall Gulch trail. Start early and you'll far less on this popular trail than if you choose it for your return route. The Marshall Gulch trail is 1.2 miles of pure sweetness along a usually wet drainage, crossing back and forth over the creek bed and traipsing along the columbine, monkey flowers and ferns. There are areas of burn from the Aspen Fire along the way, as there are everywhere and nearly on every trail of Mt. Lemmon. That's life, but believe me, this trail and hike are still sweet. Most of this trail is shaded. It's a pretty easy walk, with only a little climbing at the end up to Marshall Saddle. This saddle sits at about 7970 feet. From Marshall Saddle the signed Mint Spring trail will break off to your right and work it's way west, then north around unnamed Peak 8631 before dropping you off in Carter Canyon, on the namesake Carter Canyon Road after a total of 1.7 miles from the saddle. The Mint Spring trail does not see nearly as much traffic as Marshall Gulch, but it's still easy enough to follow. It crosses over a couple minor drainages and climbs pretty gadually up to a ridgeline at roughly 8040 feet, then slowly descends the rest of the way to the road. The first leg up to the ridgeline passes through some pretty heavily burned forest which have opened up views back south behind you of Marshall Peak and all the way out to Mt. Bigelow. There is a massive fern forest covering the hillsides, which is actually quite amazing. After hitting the ridgeline and dropping north the hillsides are covered with bright green grass. The fire has opened up views of the entirety of Summerhaven and all the peaks of Mt. Lemmon, quite an interesting view. Mint Spring itself lies at the end of the trail at Carter Canyon Road. Once on the road walk make a right and walk a few hundred yards west back towards Summerhaven. Look for the signed dirt road Miners Ridge breaking off left and switchbacking straight up the hill to your north, Radio Ridge. From the descent of Mint Spring you can actually see the road switchbacking up to a large water tank on the ridge. This is where you want to go. The road is gravel and not maintaned. It switchbacks past a couple of cabins. Follow the main road up to a water tank about a fourth of the way up, and make the hard right before the tank. Now the road starts switchbacking really steeply and becomes quite rocky. You hit the ridgeline in less than a mile, after gaining over 500 feet. The bad news is that the road veers left and heads west straight up to Radio Ridge. You are following power lines and an old service road here. It's really a hiking trail with no name. You can look back behind you for amazing views out over Mt. Bigelow and Kellog, out over the Rincons and all the way out to the Pinalenos. The Ridgeline is mostly exposed initially, and in summer don't be surprised to come across some nice, big sunflowers along the way. Eventually it enters some mixed alive and burned forest closer to the towers. The climb is pretty unrelenting up to the Ridge. In total this leg will take you about 1.85 miles from the road and gain a good 1155 feet to the towers at 8995 feet on Radio Ridge. At the towers, you may see the ski lift running. You see a signed breakoff to your right for Aspen Draw trail. Notice the sign says Aspen Trail #93 is 0.1 miles behind you. That's right...as you hit the towers make note that only 1 of the 13 towers lies to your left. Just behind this is the signed beginning of the Aspen Trail. There is a small metal sign and an old wood sign announcing this area was proclaimed a Natural Area in 1937 (or 1927, I can't remember). The Aspen Trail switchbacks southeast down Radio Ridge. It may be hard to spot from the sign, there are a number of downed trees right at the beginning. Stand up on the rocks and look down and you'll see the trail. If you make your way right and down from the sign a new makeshift route skirts the treefall and picks up the trail. The rest of the way is no problem routefinding. There is heavy burn here, with tons of ferns and grass covering the hillside. If you look there are actually a lot of young pines coming up as well, a very welcomed sight. The burn has opened up views south over Sabino Basin and the Wilderness of Rocks that are absolutely spectacular. Seriously. This part of the Aspen Trail will take you roughly 1.5 miles back to Marshall Saddle. The only place to be careful is about halfway between the towers and saddle an unmarked, unnamed spur trail breaks off to your left and heads down. Ignore this and stay STRAIGHT here. Back at Marshall Saddle you have the choice of continuing on the Aspen Trail back to the trailhead or cheating back for a shorter return on Marshall Gulch. I recommend the Aspen Trail, which takes you about 2.5 miles through some gorgeous pines along the south flank of Marshall Peak. It then descends a little and passes you through some oaks and ferns. As you get closer to the uppermost reaches of Sabino Canyon the trail breaks left and descends more ernestly as it heads north. Here you'll pass through some young aspen and ferns above your head. This is one of the sweetest stretches of the whole hike and worth the trip in and of itself. Finally the trail climbs just a touch before dropping you down back to the Marshall Gulch trailhead. From Tucson, at the intersection of Tanque Verde and Catalina Highway, go North on the Catalina Highway just over 30 miles. You will pass the small community of Summerhaven. The road ends at Marshall Gulch picnic area. You really can't miss it, it's all the way to the end. The parking is limited so come early! 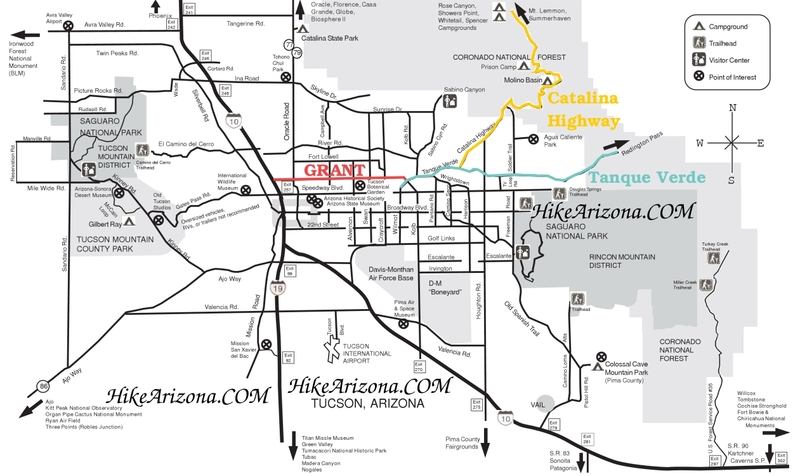 Take the Catalina Highway off Tanque Verde Road in Tucson. 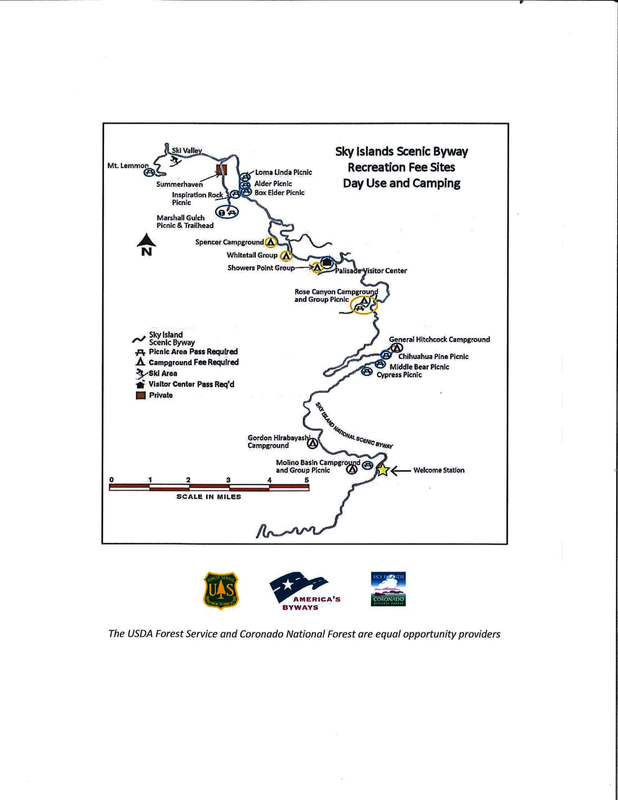 Drive 4.2 miles to the Forest boundary and continue 26 miles through Summerhaven to the Marshall Gulch Picnic Area. All roads are paved, but chains or 4-wheel drive may be required in winter because of snow. The trailhead is at the end of the road. You'll have to walk the last couple of hundred yards in winter when the road into the picnic area is gated closed.